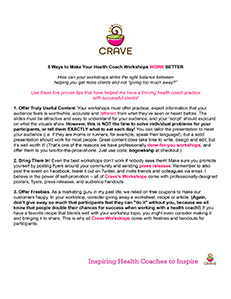 This information sheet contains some of the most life-changing marketing tips for Health Coaches — and it’s yours, FREE! I LOVE to see health coaches succeed. Over the years, as I’ve mentored hundreds of coaches, I discovered that many coaches were “giving too much away” and not getting the results they deserve from their Workshops! Download your free Workshops Work Better information sheet now, and put the tips to work to help you get better results from your Workshops! If you don’t have a workshop presentation yet, don’t worry! That’s what this site is all about! We’ve created already-done-for-you, customizable Workshops-to-Go and our Coaching Essentials Guide and Toolkit, to help you present and coach with confidence! Just look up at the menu bar and click Workshops-to-Go and Coaching Essentials to see all of our offerings and how they can help you have the health coaching practice you’ve always dreamed of!